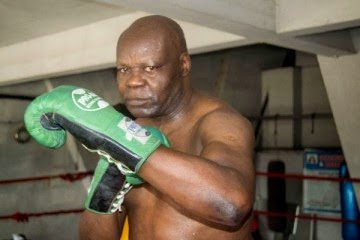 A video footage has emerged showing how Ex-boxing weight champion, Bash Ali, was prevented from seeing Nigeria's sports Minister, Solomon Dalung, after he was given an appointment at the Federal Secretariat Complex in Abuja yesterday. He was prevented by the minister's security aides who blocked the entrance to the office building. He also said that president Muhammadu Buhari must hear what is going on and that something must happen. He said either the minister leaves or he leaves. Some policemen were also seen begging the boxing champion in a bid to calm his nerves.